English New Zealand are experts in teaching English to international students and are the voice of the English language sector in New Zealand with schools located throughout the country in popular tourism destinations. 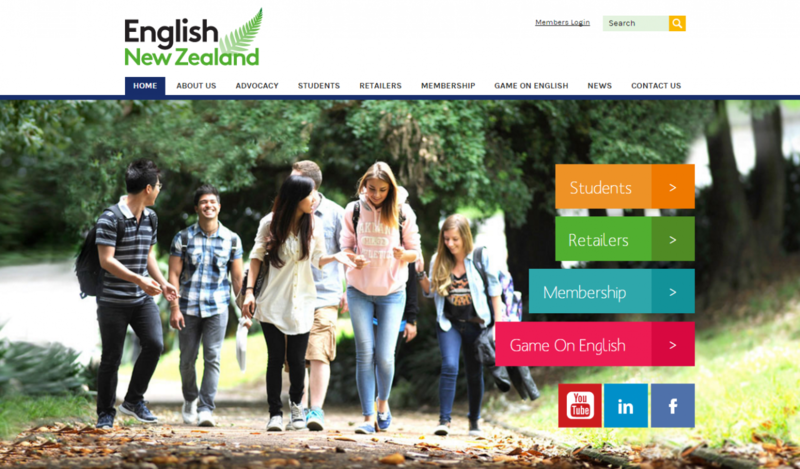 English New Zealand required a vibrant yet professional website that would be visually appealing to and easily accessible by international students (or their agents) wishing to come to NZ to study. They required a dedicated Member’s resource area including an online forum plus blog functionality to keep the site up to date with their latest news. We carried out a mobile friendly re-design and integrated the website into Orbit CMS to allow site administrators to make their own updates. Close to 30 individual member schools are showcased on the website and the translation of key pages into multiple languages was managed throughout the project. We delivered a social media strategy and continue to work with English New Zealand on their digital marketing campaign. We needed a new look and increased functionality to meet the needs of a diverse range of visitors and in particular our mobile savvy target market. We’re extremely pleased with the end result and the feedback we’ve received has been very positive. Apex provided us with excellent customer service the whole way through and everyone we’ve dealt with has gone the extra mile to meet our needs. Their digital marketing expertise has resulted in more enquiries – both to us, and to our individual member schools throughout NZ. We have no hesitation in recommending Apex to anyone wanting a “one-stop shop” for their web design and performance needs.